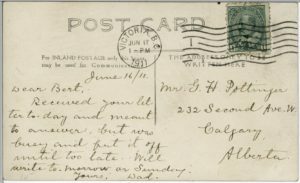 The Vancouver Postcard Club Annual General Meeting and Christmas Party is December 9, 2018, at the Hastings Community Centre, Room 9. Please note the time is noon to 2 pm. Bring items for the Annual Auction, and/or postcards to sell or trade. There will be cake, coffee and tea. All interested in postcards and our local and national history are welcome to attend. You may join or renew at the meeting or by mail by filling out and sending in the renewal form on the website. 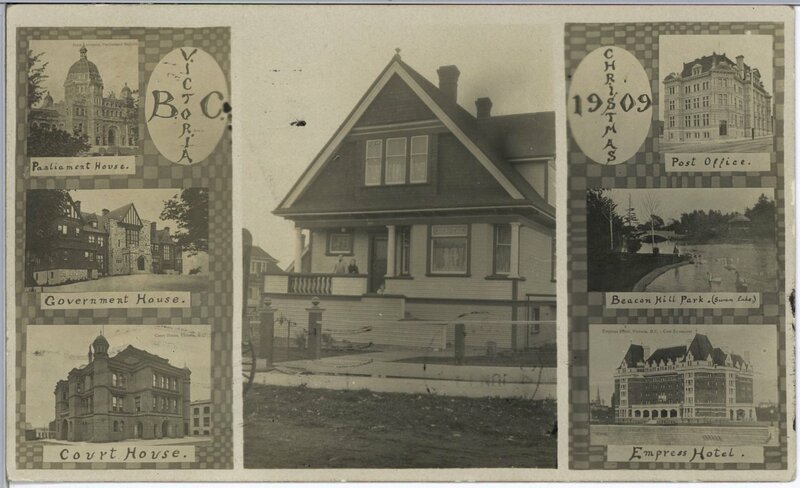 Shown above is a postcard depicting buildings in Victoria, Christmas 1909, but mailed to G. H. Pottinger in Calgary from Victoria in 1911 by “Dad”. George Herbert (Bert) Pottinger had been working as a printer for the BC government in Victoria, where his father, James, married to Clara Cameron, was then foreman. The 1910-1911 Henderson’s Greater Victoria City Directory, page 340, shows both men living at 634 Battery in Victoria. This directory listing was likely before George Herbert’s 1910 marriage to Anne Victoria Morry in Victoria. At his death, James Pottinger was remembered as witnessing the “events that are now part of the history of the province unfold themselves. And with the history of the province he had close associations.” He came to BC with his parents, arriving on Christmas Eve in 1864. 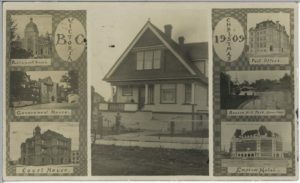 He worked on The Standard newspaper under Amor de Cosmos, and later worked in Barkerville; he surveyed on the mainland and Vancouver Island, then spent some time in Oregon; but returned to BC and worked for The King’s Printer from 1901 to his retirement. 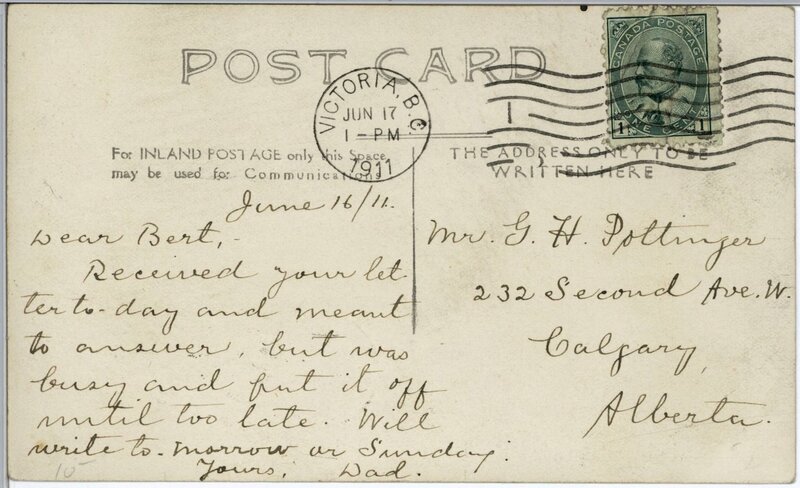 He was a member of the Victoria Typographical Union #201 for 47 years. (The Daily Colonist, 10 September, 1932, pages 1-2). Postcard images, front and back, courtesy of Simon Fraser University, Philip Francis Postcard Collection, MSC130-3475-01 (front) and MSC130-3475-2 (back).